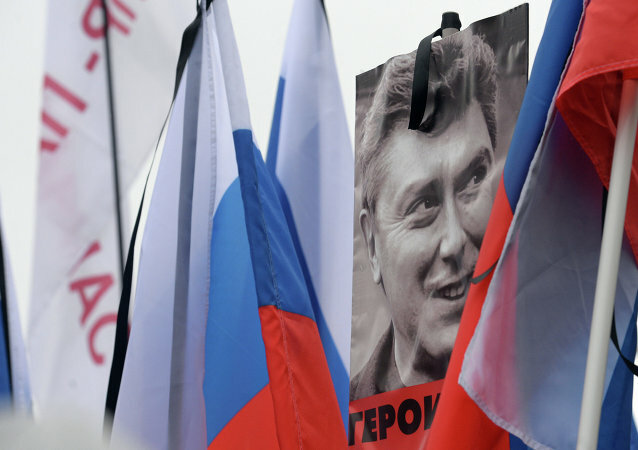 MOSCOW (Sputnik) - Around 4,500 participated in the march commemorating Russian opposition politician Boris Nemtsov on Sunday, the Main Directorate of the Russian Interior Ministry in Moscow told Sputnik. The European Court of Human Rights (ECHR) ruled in favor of one of three applicants convicted in Russia over the 2015 assassination of politician Boris Nemtsov, the court said in a press release Tuesday. The Moscow District Military Court sentenced Zaur Dadayev to 20 years in prison for the February 2015 murder of Russian politician Boris Nemtsov, a Sputnik correspondent reported from the court Thursday. Kremlin spokesman Dmitry Peskov stated that it is naturally important to find and bring to justice not only the perpetrators but also the organizers of such murders as Russian politician Boris Nemtsov's shooting death two years ago. The jury in the Moscow District Military Court was unable to reach a unanimous opinion on the case of Russian politician Boris Nemtsov's murder, a Sputnik correspondent reported from the courtroom Tuesday. US Department of State acting spokesman Mark Toner said that the Russian government must ensure that the killers of opposition figure Boris Nemtsov are brought to justice. 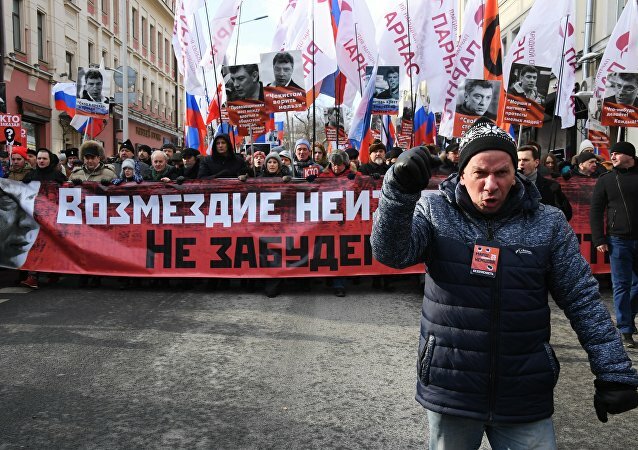 The Sunday march on the second anniversary of Russian opposition politician Boris Nemtsov’s murder was attended by some 5,000 people in Moscow, the police said Sunday. The European Court of Human Rights (ECHR) said that Russia had to pay 13,000 euros (roughly $13,843) to Shadid and Anzor Gubashev, two brothers detained on suspicion of involvement in the murder of Russian politician Boris Nemtsov, Gubashev's lawyer said Monday. The Kremlin spokesman said that both perpetrators and those who stood behind them must be brought to justice and punished accordingly. Russian President Vladimir Putin said Friday at the annual press conference that he closely followed high-profile cases, including the investigation into the murder of Russian politician Boris Nemtsov. All five defendants in the case regarding the murder of Russian politician Boris Nemtsov pleaded not guilty, a RIA Novosti correspondent reported Monday from the court room. Jury selection in the murder trial of Russian politician Boris Nemtsov will begin at Moscow’s district military court on August 24, the main defendant's attorney Shamsudin Tsakayev said Tuesday. Moscow’s district military court will consider the murder case of Russian politician Boris Nemtsov. A recent Russian FSB statement about a firearm used to kill Boris Nemtsov in 2015 will not affect the ongoing investigation. Russia's Federal Security Service said that Prominent Russian opposition politician Boris Nemtsov was killed with a homemade firearm assembled using imported parts. Independent investigators looking into the murder of Russian opposition figure Boris Nemtsov, who have previously claimed the Security Bureau of Ukraine (SBU) may have been involved in the crime, will provide further updates next week, former German intelligence agent and a representative of the investigative group Wilhelm Dietl told Sputnik. The International Criminal Police Organization (Interpol) listed Russian citizen Ruslan Mukhudinov wanted on suspicion of the murder of Boris Nemtsov. The Court of Moscow is due to consider a request from the investigation to extend the arrest of five suspects in the murder of Russian opposition politician Boris Nemtsov, according to a lawyer.